Creating a clean, green, sustainable community. A major focus in creating the Fairfield Waters community is a sustainable environmental management strategy, and maintenance of the site's immense natural resources of established trees, riverfront parkland and natural lagoons. Fairfield Waters boasts a number of large towering trees. Since commencement of the development in July 1999, over 34,000 trees, shrubs and native grasses have been planted. Existing trees have been identified as features in the master planning of Fairfield Waters. For example ... 'Five Tree Park'... majestic gum trees and meandering streets are developed around existing trees. Where necessary trees have been relocated within the site, for instance a number of large Figs now stand proud in entrance roundabouts. Introductions of shade and colour to streetscapes complement the extensive tree planting program providing all residents with an appealing outdoor living environment. 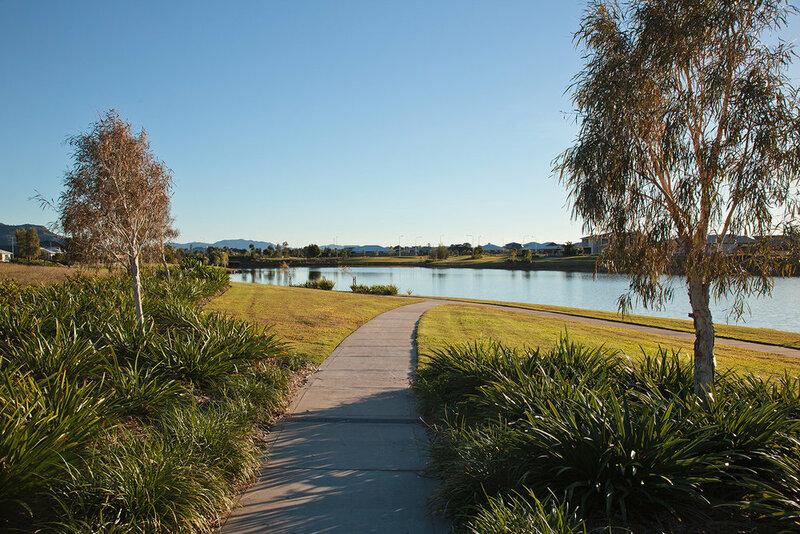 The 12km hike and bike trail weaves along the river, through neighbourhood parks and children's play areas and along the edges of the lakes throughout Fairfield Waters. The saltwater lake system at Fairfield Waters was designed with it's primary function to collect water during the wet season. Water is collected and leaves the estate via the spillway under Lakeside Drive and out into Cleveland Bay. During the dry season, saltwater is pumped into Northview Lake from the Ross River at every high tide. It is then gravity fed into Lake 2. From here, it flows into Lake 3 and finally drains out into Cleveland Bay. It is estimated that the entire volume of water in the Fairfield Waters Saltwater Lakes System is replaced every 30 days. Many fish species have entered the system from the Ross River and now live in the lakes. They attract birdlife which has created an enviable natural environment for Fairfield Waters residents. Previous owners had cleared almost all native river vegetation, in particular trees and shrubs. Riverbank planting has stabilised the river edge and highlighted the natural attributes of the river. Introduced riverbank and lagoon native plants of local provenance attract an abundance of bird life to Fairfield Waters.